Dhaani apologized. DadiBua asked where her husband was. She said he went out for work. She asked Dhaani to stay in servant’s room in the night. Dadi Bua called someone secretly and asked her to come fast. Viplav told Sushma that Dadi Bu was not doing right with his wife. Dhaani said she was their elder, and they respect her, and she said she asked me to stay in the hut. Viplav said he would handle. She said she would go. Viplav held her hand, and she went. Later DadiBua saw Viplav going to Dhaani’s room but couldn’t saw his face. Viplav came to Dhaani and kept a hand on her eyes. Dhaani said some lafanga came and was worried about Dadi Bua’s reaction and was feared. Viplav pulled her closer. Dhaani said it was just a matter of two days, and she couldn’t stay without him for a minute. DadiBua came and called the nurse. Dhaani asked Viplav to go. He went hurriedly. Dadi Bua came to Dhaani’s room and asked about that guy. Dhani said he was her husband. DadiBua asked where he eloped, and she told that he was out of town. Dhani said he just came then. Dadi Bua asked her to go back to her husband. She denied. Dadi Bua asked her to bring him next morning. She got tensed. Dadi Bua went, and Dhaani closed the door. Viplav came into the room through the window and told about DadiBua’s doubt and said Dhaani that he would drop her to the Ashram for two days as if Dadi Bua came to know about the truth, she would twist the Dasharath’s ear. DadiBua talked on the phone asking someone to come soon and said she knew he cared for me. Next morning she asked Ramdeen about the nurse. He replied she went. She said she needed an answer from all and scolded Dasharath calling him a fool and couldn’t he read home nakshatra’s and told some man entered nurse’s room at night and when she called her, he eloped. Everyone was shocked. Dadi Bua said she lied, and she couldn’t bear lie. Kanak stated that they would talk to the nurse. DadiBua replied she went and said she told her to bring her husband, and she eloped. Sushma said she might have gone to fetch him. Dadi Bua asked her home. Kanak replied tarni’s ashram. 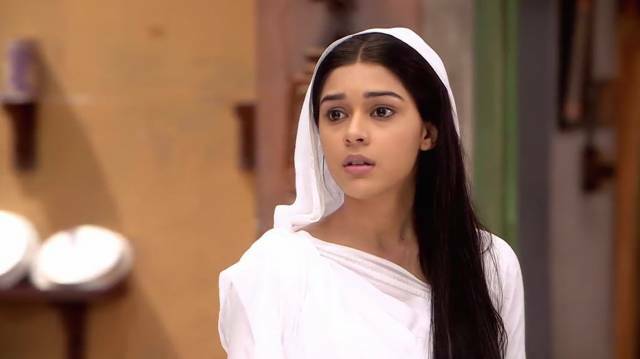 Dhaani reached ashram and told Dulari that Viplav didn’t come as DadiBua came. Dadi Bua arrived there and asked about her husband. Rajlakshmi said Viplav. Dhaani got tensed. Viplav reached there and said he came to give nurse money and gave it to Dhaani. He said Dada Ji asked him to give money, and he was going to the hospital for a check-up. Rajlakshmi and Dulari got confused. Viplav feigned stomach ache and asked Dhaani for medicine. He asked DadiBua to go. She went. Dulari enquired. Viplav said he was going mad. Dhaani explained. Viplav told Dhaani that he took shortcut knowing DadiBua came here. Dhaani said she was doubtful. Viplav stated that they had to tell the truth.